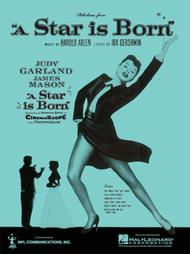 A Star Is Born composed by Harold Arlen and Ira Gershwin. For Guitar, Piano/Keyboard, Vocal. Piano/Vocal/Guitar Songbook. 24 pages. Published by Hal Leonard (HL.384828).ISBN 0881885428. 9x12 inches.